Women’s conferences are among my favorite events, both to attend and to speak at. Why? One word: intimacy. Women are usually more comfortable with their feelings than men, and as a result, when you have a room full of women who are there to be inspired and learn, the result is often a tremendously supportive environment. Speaking at a women’s conference, on the other hand, is a different matter. A keynote speaker, session speaker, or panelist for that matter, needs to have a grasp not only on what is important to women, but on what is important to all people. Connection to the audience. In a room of mostly women, there is no quality more important than creating a connection with the audience. Women are intuitive; they can see through BS. As such, they make for a highly emotionally intelligent crowd. The good news is, if a speaker can truly communicate with the people in the room, they are very likely to be open and accepting of her message. The audience wants to come on a journey with her, if she can only manage to evoke that journey with honesty and vulnerability. Speaking from the heart is one of the most valuable qualities a women’s conference speaker can have. Something of substance to say. I can’t tell you how many speakers I’ve heard that sound good but aren’t really saying anything. One can float by on style points sometimes, but nothing will energize an audience like a subject that really ties into the reason they’re there. Even if the conference centers around business or healthcare, a good speaker will come prepared to frame their speech around a subject that has deeper meaning to people. I’ve seen women’s conference speakers discuss entrepreneurship through the lens of poverty in third world countries, and marketing through the lens of human relationships. An idea of what makes women as a group special. This is a quality that I had to look for in my own self before speaking at my first women’s conference. As a man speaking at an event celebrating women, I had a responsibility to represent my gender well; to know why my audience was different from the average audience. Every speaker will have a different take on what makes a women’s audience special, but mine starts at childbirth. Simply put, it’s a gift that only women have, and during the most formative years of a baby’s life, their mother is bestowed with gifts that only she can give to this developing human being. All of us need to be responsible for the emotional and physical health of women because all of us were created and nourished by a woman. When I came to this realization, it was easy to create a presentation. I knew why it mattered that I was there. 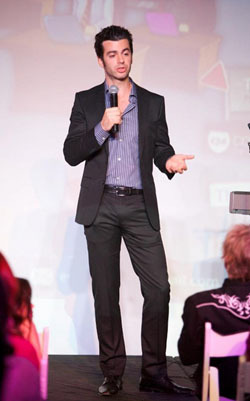 Me speaking at Women Rock It 2011. Those are my best tips for identifying a truly top-notch speaker for a women’s conference or event. If you have any other questions or need some advice, you can always e-mail me. Bestselling author: Wrote Outsmarting Google and Outsmarting Social Media. 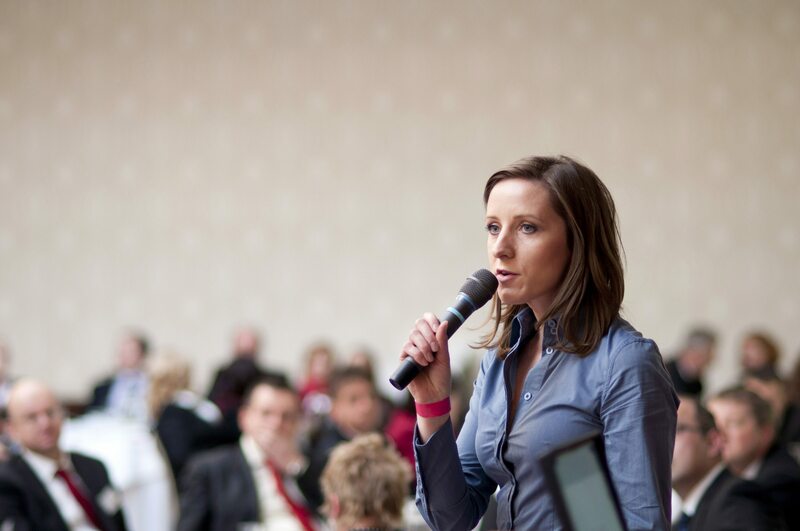 Sought-after speaker: Engagements include Women In Business Conference, Blogworld & TEDx. Real-life, hands-on entrepreneur: Built & sold 5 companies, including one of the largest websites for moms and kids in the world. Philanthropist: Women Rock It unites women; Evan Bailyn Foundation supports moms and kids. Areas of expertise: Entrepreneurship, women's empowerment, personal growth, digital marketing.